Sit back and enjoy the tow to the top, and then get ready for the slide of your life. A day at Tube World brings memories of childhood sled rides rushing back. Kids of all ages enjoy this tubing sport, perfect for a family or group outing. Better yet, you never have to walk back up the hill, simply step on our carpet lift and let it do the work. Before you know it, you’re back at the top of the hill for another run. Tube World is located four miles from the ski area in the town of Maggie Valley, across from Ghost Town in the Sky. Please remember that Tube World is NOT located at the ski area. Reservations can be made for any date December 18 and beyond. Prior to December 18, tubing tickets can be purchased on site. 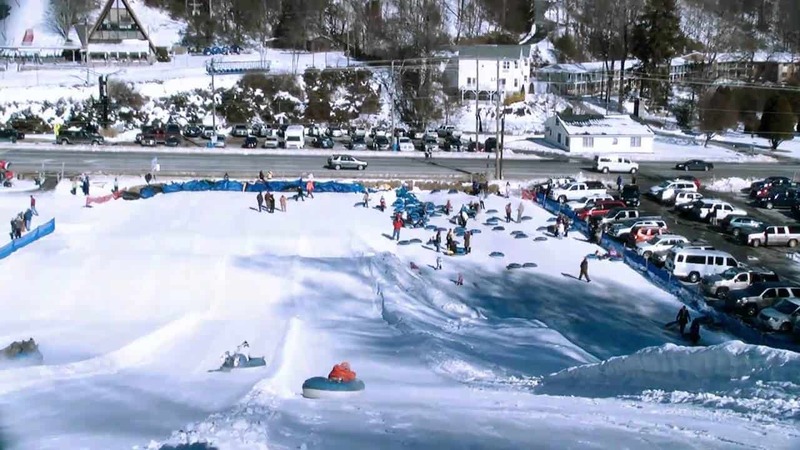 Tubing typically opens in mid-December and continues through the first weekend in March. The cost for tubing is $25 per person, per session. Sessions are one hour and 45 minutes long and run every two hours. There is a 42″ minimum height requirement. Only Tube World equipment may be used. No two person tubing allowed. Wee Bowl Snowplay Area, located at Tube World, is for children who aren’t quite tall enough to meet the height requirements for tubing on the larger hill. Wee Bowl is open on a limited basis as weather and snowmaking allows. Cost is $5 per session and runs on the same session times as Tube World. Please check to confirm Wee Bowl availability prior to your trip. Tube World supplies smaller tubes for Wee Bowl. SAVE STEPS and be prepared BEFORE you come! Be ready to go when you arrive and have your Tube World waiver formed filled out and ready to hand in. Also, don’t forget to reserve your tubing session for the date you plan to come, so you won’t be left out of the fun!